Kenneth C. Frazier, chairman and CEO of Merck & Co. Inc., a Kenilworth, N.J., pharmaceutical firm, resigned on Monday (August 14) from President Donald Trump’s American Manufacturing Council to protest the president’s refusal to denounce a rally organized by white nationalists in Charlottesville, Virginia. The rally turned violent, and one counter-protester was the victim of a vehicular homicide perpetrated by a white supremacist. “Our country’s strength stems from its diversity and the contributions made by men and women of different faiths, races, sexual orientations and political beliefs. America’s leaders must honor our fundamental values by clearly rejecting expressions of hatred, bigotry and group supremacy, which run counter to the American idea that all people are created equal. As CEO of Merck and as a matter of personal conscience, I feel a responsibility to take a stand against intolerance and extremism,” Frazier wrote. In an earlier photo, Trump and Frazier sat next to each other at the White House and shared a laugh, but the congeniality is over. Trump has come under savage criticism from almost everyone except one group for his tepid response to the white nationalist rally in Charlottesville, during which Heather Heyer, a 32-year-old woman, was murdered by James Alex Fields Jr., a Nazi sympathizer from Maumee, Ohio. Fields drove his car at a high rate of speed into a group of people protesting the rally. He also injured 19 others. The district attorney charged Fields with second-degree murder, three counts of malicious wounding and one count of hit and run. Judge Robert Downer on Monday ordered Fields to be held without bail. “He didn’t attack us. He just said the nation should come together. Nothing specific against us,” wrote Andrew Anglin, the website’s founder. GoDaddy, The Daily Stormer’s domain provider, has told the organization to move its domain or be cancelled. GoDaddy doesn’t host The Daily Stormer’s content. 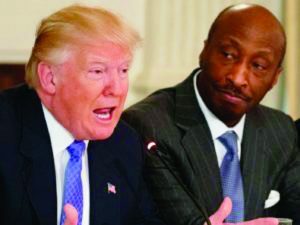 Merck CEO Kenneth Frazier was the first member of the President’s manufacturing council to resign. Over the following day, four more men tendered their resignations, as well. They are Armour CEO Kevin Plank, Intel CEO Brian Krzanich, Scott Paul, president of the Alliance for American Manufacturing, and AFL-CIO Presdient Richard Trumka.